The U.S. Department of Agriculture’s (USDA’s) first 2018/19 world cotton projections anticipate that consumption will exceed production. This brings the world stocks down by 6 million bales, more than offsetting 2017/18’s 900,000-bale increase. World cotton production is expected to fall 3.6 percent in 2018/19 to 117 million bales. 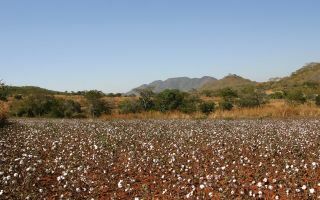 Area devoted to cotton is projected to fall more than 3 percent, to about 32 million hectares, as Indian producers in states affected by bollworm resistance reduce plantings and Southern Hemisphere producers respond to lower relative prices following the Northern Hemisphere harvest. For global production, the largest year-to-year decline of any country is expected to occur in the United States—despite little change in harvested area—as yields drop from the record-high realized in 2017/18. The world’s largest cotton producer, India, is expected to reduce production by 1 million bales from 2017/18, to 27.5 million. Area is also declining, to 11.5 million hectares, but yields are expected to rise after falling 7 percent in 2017/18. Higher yields are expected as higher-yielding states that were less affected by pest pressure in 2017/18 maintain cotton area, and have a larger share in India’s national-average yield in 2018/19. A smaller decrease is foreseen in China’s production, forecast down 2 percent or 500,000 bales from the year before, to 27.0 million bales. A small increase in Xinjiang’s planted area has been indicated by early surveys of intentions, but lower planted area in China’s eastern provinces is expected to be more than offsetting. Yield is also expected to be lower as Xinjiang’s yield returns closer to trend levels. Brazil’s 2018/19 production is expected to fall 300,000 bales as area declines slightly with lower relative cotton prices during the Southern Hemisphere planting season. Australia’s 300,000-bale decline matches Brazil’s, but is proportionally higher—6.8 percent compared with 3.8 percent—as reservoir levels there have fallen significantly since October 2017, likely constraining irrigation capacity. USDA’s China outlook is based on the assumption that China’s policies will remain largely unchanged (see Appendix), with consumption rising, and production and stocks falling in 2018/19. China’s production is projected to decline after rising for two consecutive seasons, as output in the east again declines and Xinjiang production stabilizes. Assuming a similar pattern of reserve sales in 2018 as in 2017, China’s reserve could fall to just about 20 percent of its peak of 53 million bales by the end of 2018/19. Declining reserve stocks might set the stage for a more liberal China import policy later in 2018/19. 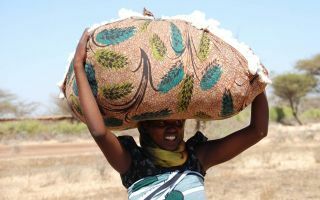 World cotton consumption is expected to continue growing in 2018/19, with a 2.0-percent increase from the year before, to 122.9 million bales. Consumption in China is likely to grow slightly faster than the world average for the fourth consecutive year—reaching 41.2 million bales—and slower growth is expected on average elsewhere in the world. Growth in Southeast Asia will be mixed, with above-average growth in Vietnam offsetting lower growth in Indonesia and stagnation in Thailand. In South Asia, growth outside of Bangladesh is likely to be below the world average, while Bangladesh continues its above-average pace of expansion. The fastest growth, however, is expected in Central Asia, where rapid expansion in Uzbekistan’s textile sector will lead to substantially above-world-average growth rates. 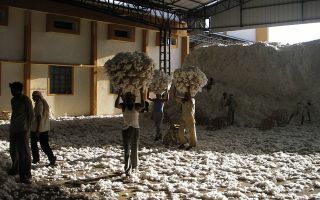 With world income growth forecast by the International Monetary Fund (IMF) in 2019 at its highest rate in 8 years—3.9 percent—cotton consumption can be expected to continue to rise. Another factor boosting cotton consumption in 2017/18 has been competitive cotton prices vs. polyester. This is likely to persist into 2018/19, as cotton prices are expected to decline. 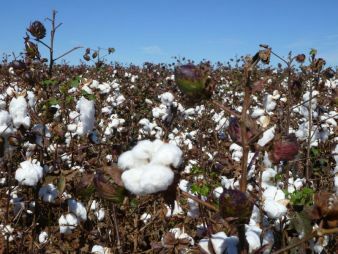 Over the 2009-2012 seasons, cotton suffered a loss in its share of world fiber consumption that was unprecedented in its severity and persistence. Since then, cotton has managed to lose share more slowly than its 1960-2008 median annual rate of decline. The return of China’s textile industry to greater participation in cotton yarn production offers a positive factor to sustaining cotton’s share of world fiber use, as does the expected downward movement in prices. Additional demand for cotton will continue to be largely derived from increased demand for all fibers rather than a recovery in cotton’s share of fibers, but favorable prices have slowed or perhaps temporarily halted the pace of cotton’s share loss. World trade in 2018/19 is projected at 40.0 million bales, up modestly from 2017/18. China’s imports are projected higher, as are those for Vietnam and Bangladesh. With larger supplies outside of China, stocks outside of China are likely to increase again in 2018/19. The A Index is projected 10 cents below its expected 2017/18 average, at 73 cents per pound.